Pick-up of guests at meeting place. Visits to Victory Square, Museum of Graphic Arts, Frunze Military Museum, Oak Park, Ala-Too Square. Lunch at Kyrgyz-Uigur restaurants "Arzu" or "Faiza". After lunch, visits to Philarmonic, Statue of Manas, shopping at Osh Bazaar, drive to historic-cultural complex "Manas Ordosu". Drop-off at Hotel/Guesthouse. 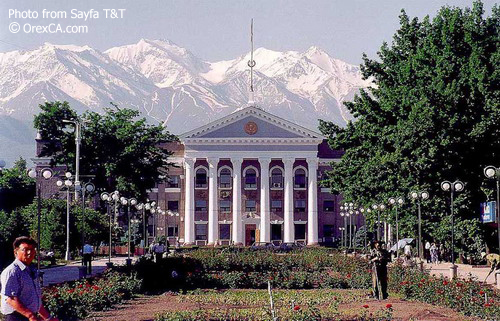 Description: Bishkek is the capital of Kyrgyzstan, situated in the Chui valley in the northern foothills of the Kyrgyz Ala-Too range at an altitude of 700-900 meters above sea level. 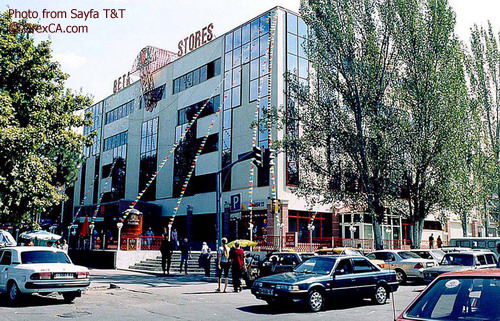 Bishkek is one of the largest cities in Central Asia and the largest city in Kyrgyzstan, with population of over 800 thousand residents. The most common languages spoken are Kyrgyz and Russian, and the city is home to a large Russian community. Bishkek is known for its variety of monumental Soviet architecture (Philharmonic, Government buildings, History Museum, Victory Square) but modern monuments depicting traditional Kyrgyz culture are also featured (Monument of Manas, Monument of Independence, etc) The city is also famous for being one of the greenest in the world, due to its countless parks and alleys, which make the town a nice place to live in the heat of the summer.